Cogito ergo sum. Or in English, I think, therefore I am. That famous phrase proposed by philosopher Rene Descartes applies to Ex Machina pretty nicely. Programmer Caleb (Domhall Gleeson), works for one of the world’s largest, if not the largest, Internet company. On a seemingly routine day on the job, on his computer, Caleb gets the golden ticket. He is selected to be a participant in an experiment by his company’s CEO, Nathan (Oscar Issac), a brilliant but self-removed member of society. In this isolated location houses Nathan’s vision, his latest version of an artificial intelligence known by the name of Ava (Alicia Vikander). She’s convincing in both shapely physical appearance and intellect, but she has to be tested. For seven days, Caleb will interact with Ava, and he will be the judge as to just how far along artificial intelligence has come. 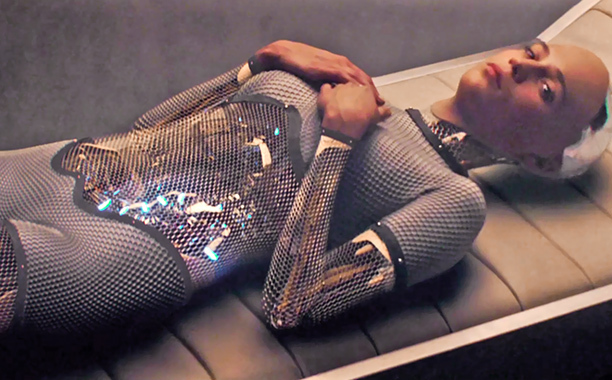 Rookie director Alex Garland’s (writer of 28 Days Later, Dredd, and The Beach) Ex Machina really is not a trailblazing piece of science fiction. Artificial intelligence is, and will always be, a common theme that sci-fi directors tackle. Probably because, as the movie alludes to, it is just the next step in the evolutionary process, and while our world isn’t completely there yet, we are not far away. It remains intriguing to analyze and discuss, and for the most part, Ex Machina and Garland present a very tight and tale. For a first-timer behind the camera, Garland experiences little growing pains. As a smaller film, the technical aspects are extremely convincing. In yours truly’s opinion, however, much praise has to go to the wonderful constructing of the film’s setting. The unnamed locale (think upper California or the Pacific Northwest) adds immensely to the story and creates a cool polarity between the futuristic themes and the older, woodsy environment. There’s more substance than true style here, but style does exist in the way of an occasionally vibrant color palate. All of this, combined with a score that gets under the viewer’s skin in a few scenes, all adds up to a technically great presentation. The only area where Garland is uneven and mediocre in his debut directorial feature is the pacing. The beginning does its job in setting up the plot and the environment, and it would be wrong to say that Ex Machina wastes time in establishing these. But, to yours truly at least, at times it is so deliberate and plodding that the movie does bog down in spots. Still, this super methodical pace allows the ideas to simmer and stew on the viewer, even if one can likely see where some strands are going. As mentioned previously, these ideas may not be revolutionary (though an awesome examination of internet search history is very profound), but they will always be important and worth talking about. There are 10 credited actors and actresses that appear here, but all that truly matter are three: Oscar Issac, Domhall Gleeson, and Alicia Vikander. Issac is on a roll now, and ends up making a character in Nathan who is equal parts eccentric, humorous, brilliant, and a little disturbing. It is refreshing to see the old template of a geeky, skinny, maybe socially awkward computer mastermind eschewed for something more in line perhaps with what a mastermind could, and does, look like today. He is never completely painted as a villain or a hero when it is all said and done, just a man who is a genius that uses his intellect on something that is simply the next step in the human process. 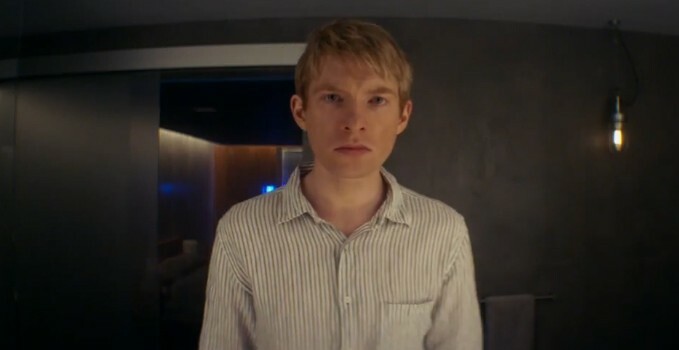 Gleeson is more of the stereotypical programmer, and not as dynamic as Issac in a performance sense or a character sense, but his reactions and motivations are convincing. Seeing the two interact and talk with each other is comparable to an immovable force versus an immovable object, from a mental standpoint at least. These two men are undoubtedly human, but the person who gives the movie a soul in my opinion is the android Ava, played by Alicia Vikander. The work she turns in is very Peter Weller-ish, which is to say that so much is conveyed only the eyes. It is a difficult thing, and Vikander succeeds effortlessly in doing so, with once scene in particular near the middle involving clothing standing out above all others. It is hard to believe this is the same actress who appears in the nothingness that is Seventh Son. 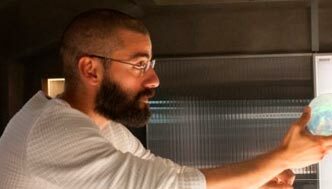 With extremely solid performances, sound execution, and sharp presentation, Ex Machina is a science fiction that absolutely is required viewing for anyone semi-interested in the genre. The fibers and ideas are nothing new, but it sure is stimulating to watch and think about. Photo credits go to blogs.indiewire.com, upandcomers.net, and elmulticine.com. Yes, yes it is sir. I absolutely loved this and raved about it in my own review. Maybe to a fault! Lol. I’m particularly hung up on, as you pointed out, the settings. Trapping this advanced world/building amidst such spectacular natural beauty offered up such a stark contrast between Ex Machina’s themes of natural progression of intelligence versus humankind’s wanting to jumpstart the process. A very thought-provoking film if ultimately nothing new. I loved your thoughts, and don’t think they were to a fault! To me, sci fi is sort of like comedy to an extent, in that some stuff resonates better with others for whatever reasons. Even with Chappie’s flaws (using that as an example), I was in the minority in enjoying it, and I still think about it here and there. It did resonate with me, but I definitely understand why others disliked it. Chappie’s AI was interesting. 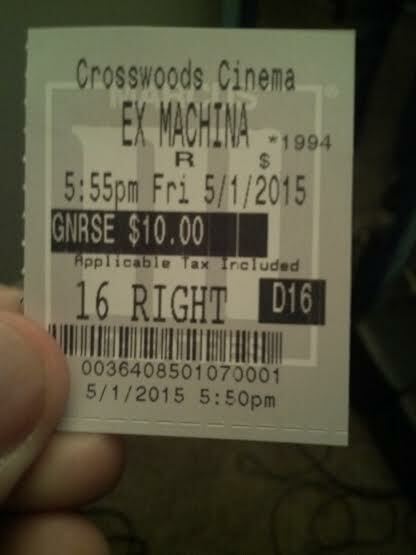 Unfortunately it celebrated the arrival of it by completely throwing humanity under the bus, and while Ex Machina doesn’t make Ava’s creator look very good either (Nathan is manipulative, egotistical, and an alcoholic to boot) we at least can understand where things may have become problematic between humans and machines in this parable. Chappie, and I hesitate to make comparisons, was just very difficulty to identify with. But I like your take on it. And I like how you reference it. Cuz Neil Blomkamp really is a compelling storyteller when it comes to sci-fi and robots. Saw it this past weekend and it was both smart and great looking. Very good movie. Good review. I did not see it but saw the trailer. From that and your review, sounds a lot like the late 1990s Outer Limits episode where a man gets to run as a test a female artificial intelligence. He’s a stereotypical computer programmer except he has a handicap and is confined to a wheelchair. He falls in love with a human who is also his physical therapist. The android falls in love with him and gets jealous. Wow, can a machine get jealous? Was a pretty intriguing episode and as you can see, nearly lifted to make this film it seems. I loved The Outer Limits as a youngster! Scared me a few times though lol. I definitely see this being right at home in that series. I recommend giving a watch sir. Great review. I definitely agree about the setting, the juxtaposition between nature’s progress and humanity’s. I loved how his place was built into rocks, it gave it such an ageless feel while highlighting the rapidity of progress taking place within its walls. Totally agree with this point. Vikander manages to express so much by doing so little, its a very rare and great attribute. Thanks for visiting man. I didn’t know she had it in her after Seventh Son! Intrigued with her moving forward.